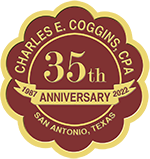 Located in San Antonio, Texas, Charles E. Coggins, CPA, provides numerous tax services from individual tax returns (1040) to corporate tax services (1120, 1065). Charles E. Coggins, CPA, also provides other accounting services. The primary focus is individual and small business accounting needs. Please see the Services page for a comprehensive list.